One of ExamDiff Pro's most popular features is the Line Inspector panel that allows you to easily visualize the differences between two matching lines. 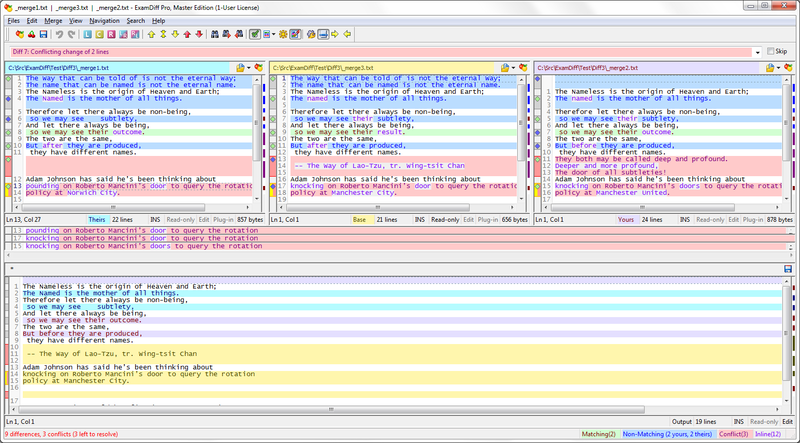 Until now, however, the Line Inspector could only be used for two-way comparison, not three-way merge. From the Line Inspector panel, you can select which block to use by right-clicking and choosing one of the Use ... options in the context menu. Unlike the Line Inspector for two-way comparison, in three-way merge you cannot reconcile changes on a line-by-line basis, only on a block-by-block basis (this is because the lines in the output pane cannot necessarily be mapped to the lines in the other panes). The Line Inspector works the same way for two-way merge as for three-way merge, the only difference being that it shows two lines rather than three.